Is buying organic food important to you? How much of your grocery budget is spent on organic food? Where do you go for solid information on nutrition? Have you heard of the term, “Beyond Organic”? Geesh, good thing I’m not the sensitive type, eh? What I didn't go on to tell her, is that it's also so much more than the organic label when it comes to soil quality. Mass produced organic foods are never going to be as tasty or nutritious as food grown by your local farmer who knows how to cultivate soil that's LOADED with nutrients. To learn about all of this, get my book, Real Food for Rookies — it explains more plus it has a whole section on the top 10 foods to avoid and the top 10 foods to add into your diet for optimal health. Or click here if you want the first chapter's entire real food ingredient guide. Goldie is approachable and your niece could convince her to help out as well. Goldie is an old crunchy granola hippy who founded our organic foods coop in Seattle and I’m sure would love to connect with her. I agree about Beyond Organic. White flour and white sugar can be purchased organic. But they are not good for us. We purchase almost 100% organic here in London. Mostly because so much is shipped in from all over the world, so I need some barometer of trust. When we lived in Northern Calif. I purchased so much locally that wasn’t certified organic, but I knew the farmers didn’t spray. I sometimes skip organic avocados. But even our soaps and household clears are organic. Organic does tend to be the focus, doesn’t it? I’d much rather buy, for example, milk that isn’t certified organic, but I’ve visited the dairy and I know how it’s run vs organic Walmart brand milk off the store shelf! And I love the new look. I’m likely way behind, I don’t get to visit blogs as often as I like, but I love the pumpkin color! I’m in the process of trying to educate my sister. Really appreciate the links and comments here. I agree with going beyond the organic statement. We are a 100% grass-fed dairy and believe that grass-feeding and animal welfare are important points to consider when choosing milk for your family. You’re right, it goes waay beyond organic. Since we’ve acquired some backyard hens, finding humanely handled meat and eggs are very important to us. We buy our meat from a local farmer, but when I do have to buy any meat at the store, I do check to see if it’s certified humane. I don’t want meat that’s spent it’s life on a CAFO. We spend a lot on organic food. We have a family of 9 (7 kidlets), and probably spend 3/4ths of our grocery budget on organics (I do consider our grassfed meats organic, even though they’re not “certified”). We bake our own bread, mill our own grain, have a garden, 3 hens, and are part of a produce co-op. Those things do make eating healthier a bit cheaper (but cheap’s relative when feeding a large family). I find that getting raw milk, pastured eggs, butter, etc, to be a priority for us. Another important thing to note is that if you’re eating nutrient-dense foods, you don’t need to eat as much, so that does cut down on the grocery bills. Yes, buying organic is very, very important to me. All of our nuts, seeds, spices & herbs, dried fruits and fresh produce is purchased organic. The only exceptions I can think of are melons and avocado. We go through a lot of avocados and the cost for organic is just outrageous, so I do purchase non-organic just to try to stay on budget. For frozen produce, most of what I buy is organic, but there are times when I will settle for non-organic because of either cost or lack of an organic alternative. I’m not to the point of purchasing organic coffee or tea, so those are non-organic for now. 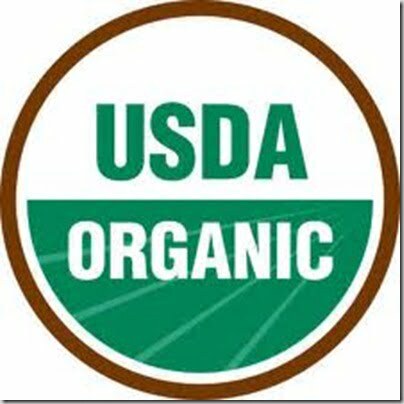 Our meat, eggs, and milk are not certified organic. However, our beef and milk come from grassfed cows. Our eggs and chicken come from pastured poultry. I’m sure the chicken’s grain feed is not organic, but I’ve yet to run across anything that pure that’s available locally. We purchase pastured pork from a local farmer, but again I’m sure that the grain feed isn’t organic. So, I’m not able to give a percentage of our budget that’s organic versus non-organic. The above is the best breakdown I can do. Is buying organic food important to you? Yes and no :). I try to follow the dirty dozen, clean 15 for sure. There is a book called To Eat or Not to Eat Organic that helped me a lot. I don’t worry about bananas, US cantaloupes, or cabbage and such but do worry about apples, tomatoes, celery, lettuce, and other things. I really miss tomatoes and only buy from a certain farmer at the market during the season who doesn’t spray and actually just picks off the bugs. Hopefully I’ll get some romas from a local farm this weekend and try making sauce. How much of your grocery budget is spent on organic food? Maybe half? I’m just guessing. Sometimes more if I’m buying a bag of apples and potatoes, sometimes less if I don’t find the organics that I want (and just do without). Sometimes I can find what I want in organics but it’s just too expensive. For some reason $2+ for a head of lettuce seems too much for me. Am I just a cheapskate? We only have a budget of $100/wk for a family of 5 (sometimes less, maybe $35) so I have to really watch and STILL stick to my guns regarding certain organics. Somehow God always provides and we eat pretty well, considering! This is the methodology behind the well-known “Dirty Dozen/Clean Fifteen” list. Put out by the EWG. I love your quote to her. I feel like a recording sometimes. When people hear about how I eat, they think it’s all about organic, and it SO much more than that. I find some of the best info on small family farm websites – people who are passionate about what they do. Such as Joel Salatin’s site. https://www.polyfacefarms.com/ Or his friends at Your Family Cow. https://www.yourfamilycow.com/ And many of the places I feature on my local food site.